Morchella crassistipa (the epithet means "thick-stemmed morel") is a northwestern species named in 1938 by Leon C. Snyder. Unfortunately, DNA testing of Snyder's holotype collection (the collection he designated and preserved to define the species for future mycologists) by my collaborators (Kuo et al., 2012) revealed at least two phylogenetic species present in the collection box--which means that Snyder's species name must be considered doubtful in a contemporary setting since there is no way of knowing which of the two species in his type collection is the one that should be labeled "crassistipa." 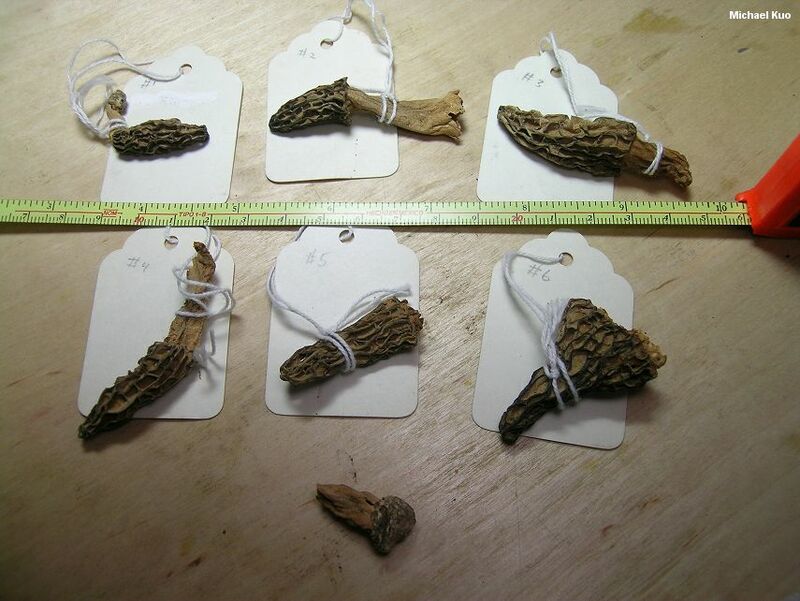 In order to honor Snyder's work on morels, and, as much as possible, his species concept, I chose the name Morchella snyderi to represent the phylogenetic species matching his morphological description of Morchella crassistipa, and designated a new holotype collection. REFERENCES: Snyder, 1938. (Kuo et al., 2012.) SPECIMENS EXAMINED: Herb. WTU: Holotype. 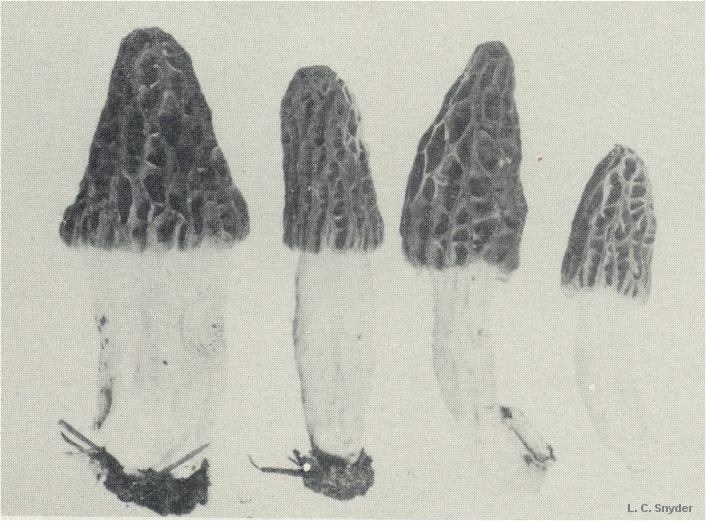 Morchella crassistipa Snyder, 1938: University of Washington Publications in Biology 8: 52-53. Original description (Snyder 1938): "Pileus elongated, obtuse, or conical, reaching a length of 4-5 cm., and a diameter of 4 cm. at the base, adnate to the stalk at the base; pits elongated, yellowish-brown within and brownish-black on the margin; ribs irregular, anastamosing, narrow, less than 1 mm. wide, brownish-black. Stalk stout, 3-6 cm. long and 1.5-4 cm. wide, of uniform diameter throughout, irregularly lacunose, covered with numerous wart-like projections. Hymenium lining the inside of the pits, yellowish-brown; asci cylindrical, 350-400 x 2-25 µ, 8-spored. Spores ellipsoid, 16-20 x 25-40 µ, smooth. Paraphyses few, very large. In open woods of Pinus ponderosa, Cle Elum, Washington (Snyder), May 5, 1934." 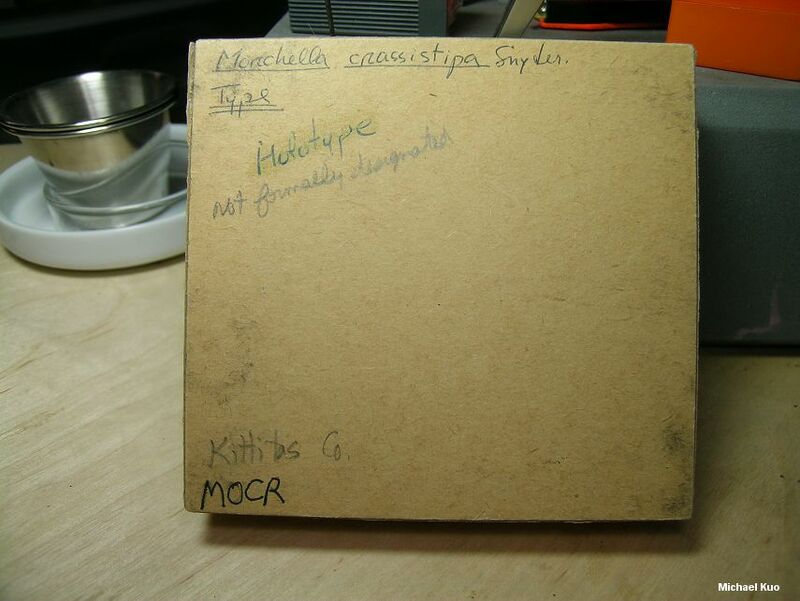 The holotype of Morchella crassistipa is held in the Herbarium of the Burke Museum of Natural History and Culture at the University of Washington (WTU). 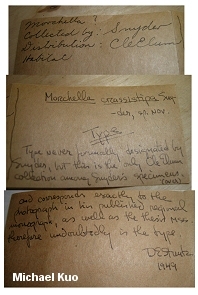 A note from D. E. Stuntz, dated 1949, accompanies the collection: "Type never formally designated by Snyder, but this is the only Cle Elum collection among Snyder's specimens and corresponds exactly to the photograph in his published regional monograph, as well as the thesis mss., therefore undoubtedly the type." The collection consists of six partial or complete, well preserved ascomata which are individually labeled specimens #1-6, as well as a stipe fragment that probably belongs with specimen #5. Despite Stuntz's comment, the four specimens illustrated in Snyder's 1938 publication cannot be aligned with confidence to any of the six specimens in the holotype collection, with the possible exception of specimen #6, which appears to correspond to the large specimen on the left side of the photograph (but which unfortunately lacks a stipe). Data from study of the holotype. Dried ascomata 40-60 mm high. Hymenophore 22-40 mm high x 8-27 mm wide, with 8-20 primary vertical ridges and occasional shorter, secondary vertical ridges, with occasional or frequent sunken, transecting horizontal ridges. Ridges finely tomentose; flattened, or in more mature specimens (especially specimen # 6) becoming sharpened or eroded. Pits finely tomentose. Stipe 15-35 x 5-12 mm; punctate with granules; ridged in places. Ascospores highly variable in size (21-35 x 13-22 µ;), even within an individual ascoma (especially specimen #4); generally larger (25-33 x 16-22 µ) in more mature ascomata (especially specimen #6) and smaller (22-26 x 14-17 µ) in ascomata in which asci are not collapsed; elliptical; smooth; contents homogeneous. Asci 125-250 x 17.5-27.5 µ; 8-spored; cylindric; hyaline in KOH (2%); mostly collapsed in specimens 4, 5, and 6. Paraphyses 100-175 x 5-12.5 µ; cylindric; septate; apices rounded, subacute, subclavate, or clavate; hyaline in KOH (2%); mostly collapsed in specimens 1, 4, and 5. Elements on sterile ridges 75-175 x 12.5-30 µ; septate; terminal cell usually clavate but occasionally widely cylindric with a rounded apex; with hyaline to brownish or brown contents in KOH (2%). DNA was successfully extracted from two ascomata in the holotype collection following the methods of O'Donnell and collaborators (2011); ITS and nLSU sequences placed one ascoma (specimen #6) as conspecific with Morchella snyderi and one ascoma (specimen #3) in the elata Clade, near species Mel-19 and species Mel-20 as defined in O'Donnell and collaborators (2011). The available sequence data is insufficient to determine whether this collection represents a novel phylogenetic species. Discussion. 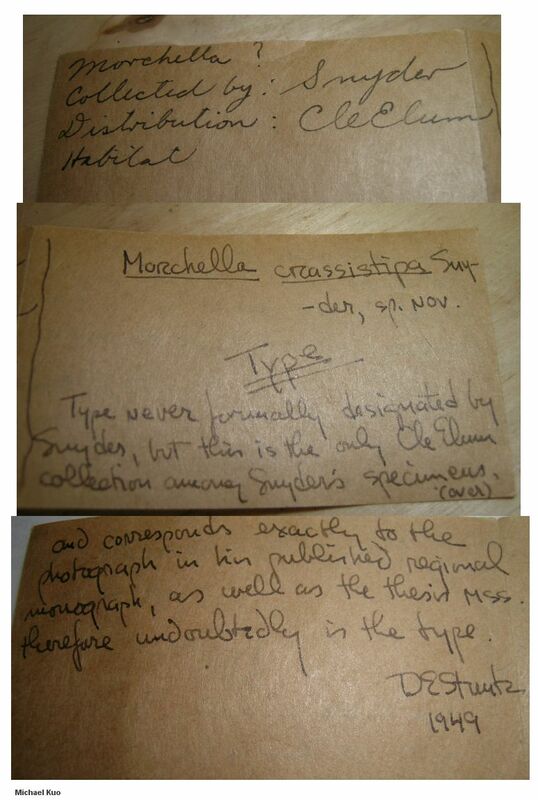 Because molecular results indicated that two of the specimens in the collection represented separate phylogenetic species (see data above), we were obligated to consider the holotype of Morchella crassistipa as mixed, and therefore treat the name as a nomen dubium--especially since, while specimen #6 corresponded both morphologically and phylogenetically to Morchella snyderi, its stipe is unfortunately missing and we were unable to assess one of the morphological features that characterizes the species, its ridged and lacunose stipe. Snyder's original 1938 illustration appears courtesy of the University of Washington Press. Kuo, M. (2012, November). Morchella crassistipa. Retrieved from the MushroomExpert.Com Web site: http://www.mushroomexpert.com/morchella_crassistipa.html.